”Some people are pioneers. They kind of walk with a machete in their hand clearing the path for all the other people walking in the same kind of direction. Anni Sennov – you are a most important pioneer. While most of us where busy upgrading our phones you not only helped others upgrade their energy system with AuraTransformation, you also taught many of us to become mediators so we could pass it forward. – It is clearly the coolest treatment I have ever taken or given. Thank you for focusing on love and writing this beautiful book about Spirit Mates. The book is radiating love energy and we are very honored to be part of it. Boken om Spirit Mates är en spirituell manifestation av kärlek – att det omöjliga faktiskt är möjligt! ”Det” finns på riktigt och beviset finns i boken! Boken har allt! Svidande fakta! Tårdrypande avsked. Brinnande passion. Men mest av allt RÅ sanning. Har funderat i flera dagar på hur jag ska kunna uttrycka mig på bästa sätt så att du verkligen förstår hur tacksamma vi är för din hjälp. Men orden räcker inte till. På vägen hem från dig blev min man frusen, illamående och fick ont i kroppen. Han trodde att han skulle få influensa, så jag fick köra hela vägen hem. Men dagen efter vaknar han och känner sig ”som en ny människa”. All ångest och oro är borta och han känner sig full av energi. Hans enda oro just nu är förstås att detta tillstånd ska försvinna och att han ramlar ner igen. Han är glad för varje timme han får må så här, säger han. Själv känner jag mig lite trött, men otroligt lättad. Äntligen!…..så känns det. Så TACK Anni, från djupet av våra hjärtan! “AuraTransformation™ found its way into my life during the spring of 2011 at a fair, where Berit Hickman was giving a lecture about the new time children and energies. The lecture changed my life and I knew I had found the “missing puzzle piece” in my life. I received my own AuraTransformation™ treatment on May 2011 and then took the first Aura Mediator Course held in Finland during the autumn of 2011. Already during the course, I had a conversation with Berit about the possibilities of continuing to pursue this avenue even further, because I wanted to share this incredible knowledge with everyone else. Berit had a conversation with Anni Sennov, the developer of AuraTransformation™, and the regular Aura Mediator Courses got started in Finland during November 2011. The years of cooperation with Anni Sennov set off the process of running my own Aura Mediator Courses in Finland. 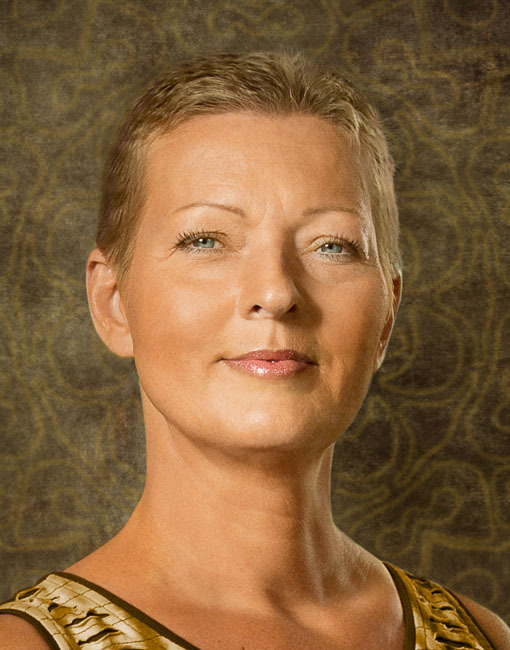 Anni has been a mentor, a coach, a close cooperation partner, a friend and an untiring support all these years that I have worked as an Aura Mediator™, done AuraTransformation™ treatments and trained Aura Mediators in Finland and abroad. Anni’s way to guide and train you is direct and frank and opens new ideas and dimensions (which fits well for Finnish people). As a cooperation partner and mentor Anni “pushes” us forward gently but in a determined way, also with joy and humour, to use our own energy to find and live out our own dharma (own mission in life). Working with Anni is inspiring, developmental, fun and it challenges people’s own ideas and ways of acting. There is always something new to find from Anni´s numerous books, that will take people’s own thinking and behaviour in a new direction. What has most meaning for me is to live my own truth and be a person who moves forward in a balanced way using and honoring the physical, mental and spiritual parts of my being. ”Hej Anni! Det ar lite magiskt att äntligen nu idag sätta mig på ett cafe med dina böcker. Jag får galet mycket inspiration så detta vill jag fortsätta göra. Jag är obeskrivligt tacksam över den hjälp som jag fått av dina kurser och webinar och såklart själva ATn. Jag önskar innerligt att jag på något sätt ska kunna jobba med människor på ett sätt så att de kan komma vidare och till rätta med sina liv. Tack kära Anni för att du ger mig och många andra den här möjligheten. Jag vill skriva till Dig, Anni och TACKA Dig för alla underbara böcker du har skrivit! Och den kunskap som du förmedlar fram. Det är så FANTASTISKT att man får vara med om den här förvandling som nu sker här på jorden. De har gett mig så mycket! Mitt riktiga jag börjar komma fram och jag får vara den Lisa jag är innerst inne. Att få uppleva den kärlek som jag nu upplever till mig själv är helt Fantastisk! Att få känna den styrka och rakhet i kroppen. Att få stäcka på sig och var stolt över sig själv. Att få känna lycka och glädje. Att kroppen får säga det den vill, för det är från mitt hjärtat. Att känna flödet i allt vad livet innebär. “The work I do with Anni is substantial and life-changing and has brought me to my next level of excellence and personal energy. ”Anni Sennov är en kvinna som jag instinktivt har vetat att jag måste få träffa en dag. Ända sedan jag läste den första boken av Anni så kände jag en stark dragning till henne, det kändes som att vi hade känt varandra länge innan vi ens träffats. Anni har en förmåga att hjälpa en att se precis det som behövs för att den inre bilden ska klarna. Hon visste exakt hur jag tänker och känner och hon gav med värme och kärlek mig möjligheten att själv få fram min inre sanning som alltid funnits där. När hon beskrev hur hon tror att jag har känt mig och känner mig så var det som om vi var gamla vänner – hon beskrev mig så exakt! Det som gjorde mig mest glad och tacksam över Annis balansering var känslan av stolthet, styrka och glädje över mig själv som Anni hade förmedlat. Det märktes att Anni ville visa mig vem jag är och att jag är så viktig för henne. Det är ju tack vare Annis hårda arbete i både med- och motgångar som har givit mig den här fantastiska möjligheten att vara med och höja energifrekvensen på Jorden. Det är underbart att vara Jag! Tack Anni för att du gav mig insikt och mod att inse det! “I have had the privilege to get to know Anni Sennov and her work through my own AuraTransformation™, later as an Aura Mediator™, as an Aura Mediator Instructor™ and not at least as an associated partner in four element profile™ together with Carsten Sennov. The essence of this experience is powerful and developing. I believe in the synchronism of things and situations and when and how they happen, and feel blessed to be able to create a fundament for balance for myself. Knowing that my balance is creating a fundament for a balance on a wider scale on this Earth and in the Universe as a whole, feels pretty Great. Anni Sennov has made this possible through her own powerful belief but also through her life challenging efforts, which she shares so dedicated and well. She is not only a Channel, she has brought forward tools and made it possible for people like me and you to live our purpose. Life is a struggle for most of us, and we must all carry the weight of our understanding here on Earth. The consciousness’ that surrounds Anni Sennov and her knowledge make it a lot easier to be a normal human being because she has a capability to lift our intention in a balanced way. I believe as her that we are here on Earth to be individualized and feel very fortunate to be able to live my Dharma! Equally important, I know from within that it is all connected as a wholeness that we can understand if we choose to be present and responsible. I salute and embrace Anni for her Stamina and loyal approach to me and all those who choose to connect with their true inner self. It is not a cliché, it is a fact for me; Why not do it the Venusians’ way! I know Anni can help You to get ahead with your journey! “How would I describe Anni Sennov? Well, I would say Anni is in a way like a Sun. She “can’t help herself” from giving. But there is something behind that Sun, which is even stronger. Like behind the explosions of a thousand race horses, or race tigers if you prefer, there is this Jockey of Crystallized Air, with an enormous capacity of, I would say, discerned listening and ability to transmit with a grounded quality. Cause, when a high-voltage spirit incarnates in a woman’s body, it will be with humour and warmth and with the accurate truth as well. All will be given, and all will be contained. “Anni is a very special woman. So strong and so sensitive and so clear in her speech and in the way she reads and sees you. I got free of my social fear and felt more relaxed among other people. And more self-secure inside. I always listened a lot to what other wanted me to do or what they thought I should do. Anni helped me believe more in what I felt inside. I still make a lot of wrong choices. But they are mine and not so scary anymore. I am still a thinker and it is still difficult to make the choices. But now I know how it feels doing it. The balancing healing I received made it harder for people, family, and friends to cross my boundaries. And it gave me more power to stand on my own beliefs. Anni’s energy books have also helped a lot. Very much in understanding my very sensitive daughter. And given me tools to get my energy back if I lose it a stressful day. “In 2007 I consulted Anni Sennov the first time. I just got headhunted to a reputable job with lots of responsibilities, influence, and employees while I was 6 month pregnant. They really wanted me and my excellent skills. The career path pointed upward only! Strangely enough after a short while, it didn’t feel meaningful. My whole life had been about defeating challenging tasks and hunting victories and all of a sudden I just felt empty and tired. And what an impact that first consultation with Anni Sennov had. My life was never the same again! Nor my family. The transformation was enormous. My life is now all about passion, freedom, living light, simple and in sync. Doing my Dharma-thing! I do not search any longer, I trust and listen! Som verkar för samverkan och ”runda nätverk”, inte en ny pyramid. Ingen ”idoldyrkan” inför dig utan en människokvinna med familj och fantastiska andliga visioner/kunskaper. Du verkar för att ge makten/kraften tillbaka till individen så att den kan inse sina egna styrkor, ta ansvar och skap det liv den vill leva. Precis min stil J! ”Hej Therese och Anni! ❤️ Åhh vilken härlig vecka det har varit efter den fantastiska workshopen! Jag är så tacksam att jag inte missade detta. Jag flög nästan hem efter workshopen, high on life trots busvädret. Dagen efter var jag pigg och mådde fantastiskt trots att jag egentligen borde varit dödstrött eftersom jag bara sovit några timmar. Min intuition har ökat enormt – flera exempel den senaste veckan. Hörde tex inom mig att telefonen ringde fast den var på ljudlös. På ett lunchmöte skulle de vara 6 men jag hörde siffran 8 i huvudet, och visst blev de 8! And so on! Häftigt. Nu ska jag arbeta upp en lyhördhet för infon jag får till mig. Och så lita på och agera utifrån den. Det beteende jag valde att ändra på är något som går hand i hand med att uppfylla mina mål, det var att ta hand om mig själv/min hälsa och komma igång med yoga och konditionsträning, och det har ju bara gått en vecka men jag är igång! ”Jag vill först och främst tacka dig Anni för ett mycket berikande och medvetande höjande Webinarium. Det hände mycket i min kropp emellan webinaren både utrensande och smärta i kroppen som fick min kropp och maind att reflektera och utforska. Jag känner att de önskemål jag ville utveckla har satts i rullning och att fler och fler av önskemålen faller på plats. Tidigare var mina önskemål långt borta och vissa kändes nästa ouppnåeliga och nu börjar de komma närmare och närmare min verklighet. Det som blev en viktig del för mig personligen var att jag har börjat landa mer i min kropp trots att jag fortfarande har lätt för att vara uppe i mina tankar. Jag känner mig lugnare i kroppen nu när jag vet hur jag ska balansera mitt maind och kropp samt att balansera energier. Jag har börjat rensa energier mer vilket i mitt fall är väldigt nödvändigt. Jag har börjat sova bättre när kroppen blivit lugnare. Jag känner att jag har börjat få en bättre intuition vilket jag så önskar. Din meditation med glädje, kärlek, balans o stillhet gör stor skillnad i mig själv när jag matar hjärnan med dessa positiva affirmationer vilket blir en transformation i sig o jag känner mig mer glad och tillfreds inombords. Alla mina blockeringar med firmans namn och förändring har varit en stor börda för mig under flera år som jag har funderat på förändringar runt firman upplägg och mitt sätt att jobba har nu fallit på plats. Detta är verkligen en skön känsla att äntligen få komma ut ur garderoben på något sätt eftersom jag har ändrat mitt efternamn för över ett år sedan och jag har inte kunnat kliva fram med nya firmanamn och mitt egna nya efternamn. Tack också för de personliga samtal du ger där du kan sätta ord på mina begränsningar och vad jag behöver arbeta med personligen som jag själv inte har kunnat satt ord på men känt att något är fel. Här är du så fantastisk träffsäker och kan på ett enkelt och sakligt sätt beskriva problematiken och öka mitt medvetande och jag kan se mitt problem som begränsar mig från min begränsande synvinkel. Tusen tack Anni för allt du delat med dig till mig jag ser fram emot våren med modul 2. “I participated in the Transformational Webinar Module 1 in the fall of 2016 and really enjoyed it! Especially since I currently live in a place that has lower frequency energies, it was so great to participate in a group experience that extended over a 4-month period where I could meet and interact with other high-frequency people. It was nice to make some long-distance friends and know that we can continue to be in contact with each other even after the Module ended. Besides the beneficial social aspects, all of the topics covered in the Module were on point and particularly relevant to my life. It was really helpful to hear both what Anni shared at each meeting and in my individual 1-on-1 with her, as well as getting feedback from other group members once we had divided into smaller discussion groups. I gained a lot of clarity on my Dharma as well as ideas on concrete action steps to take to more fully live my Dharma. “I participated in the Transformational Webinar Module 2 earlier this year and by all accounts, I can honestly say that it was a life-changing experience! Particularly after the last group meeting, within 24 hrs I noticed a big shift in my own self-acceptance and began really embracing a huge part of me that I had been ignoring and suppressing. This totally changed how I now see myself and also helped me to uncover more clarity on my Dharma. The 1-on-1 with Anni at the end of the module was also extremely helpful and now I have a much clearer sense of my direction going forward. Thank you, Anni! Jag vill passa på att tacka för ett mycket givande transformationswebinarium modul 1. Din kunskap och intution är ”spot on”. Dessutom har förbättringar vad gäller ekonomi och möjlighet att jobba deltid manifesterats nästan som av sig självt. ”Jag har deltagit i Annis Transformationswebinarium & det är nåt jag varmt kan rekommendera. När jag såg informationen om workshopen kände jag bara ett stort ”JAAA, det vill jag fara på”. Jag älskar att dansa så det var nog därför som jag läste det direkt jag såg att det stod Dance & Power workshop, men orsaken till att jag vill åka var större än så. Hela mitt väsen skrek efter att åka dit. Trots lite farhågor kring ekonomi, resa, boende och barnvakt så löste allt sig jättesmidigt. När det sedan började närma sig dagen för workshopen så kände jag mig förväntansfull och nyförälskad med pirrande känsla i hela kroppen. Jag tyckte att det var lite jobbigt på morgonen när jag kom till platsen, innan workshopen började, för jag hade inte träffat någon av deltagarna tidigare och det kändes som att alla andra kände varandra eller iaf någon där. Men det var så fantastiska människor så känslan höll inte i sig så länge, och många kom fram och hälsade och pratade lite. Under dagen fick jag många nya bekantskaper och vänner. Tillsammans delade vi en dag av kraftfulla, kärleksfulla och förlösande energier och massor av glädje och skratt. Det var underbar gemenskap, och även de stunder det kom upp jobbiga känslor och minnen så kändes det tryggt. På kvällen efter workshopen var jag full av energi och hade ett lugn inom mig, som att jag kommit mig själv ännu närmare. Kände mig även lättare, det var så påtagligt att jag släppt en massa gammalt som inte längre gagnar mig i min utveckling, så det kändes mycket lättare att röra sig. Sedan hade jag självklart lite ont i fötter och muskler efter allt dansande, men det var det verkligen värt! Jag vill absoluta var med fler gånger, har redan skrivit in nästa års datum i kalendern. Längtar till nästa möjlighet att få uppleva något liknande!! Tema spelar ingen roll, att få träffas så många likasinnade och få uppleva de energier och krafter som kan skapas när man är så många är oslagbart. Det går inte att beskriva med ord, det måste upplevas! Jag är väldigt tacksam för att jag fick möjlighet att vara med på denna dag! TACK Anni och Therese! Jag är väldigt imponerad över er kraftfullhet, att ni lyckades hålla energierna när vi var så många. Jag har varit på workshops där antalet deltagare är begränsade pga att ledarna ska kunna ha uppsikt över vad som händer med alla och kunna hålla energierna som byggs upp. Roligt att få träffa er live också, ni är härliga människor! Jag hade varit med de två tidigare workshops i Sverige, Lidingö och Gävle, så jag har lärt mig att det känns rätt om jag ska delta på någon workshop. Ingen idé att grubbla ifall det är värt pengarna eller tänka logiskt. Varje gång har gett mig valuta för pengarna! -Hur kändes det innan Workshopen? Jag har haft tidigare erfarenhet att det händer saker redan innan något sådant här tillfälle. Magen krånglade, sömnen blir lite sisådär. Inget att grubbla över utan jag ser det som att ungefär tömma glaset på det gamla vattnet för att fyllas på nytt friskt vatten, då min kropp är glaset och vattnet är ens personliga energi så är det inte så konstigt att det känns lite jobbigt innan och efter ett sådant här tillfälle. Men på själva dagen så brukar jag känna mig superbra och levande. -Hur upplevde du energin under dagen? Helt himmelskt underbart! Det svängde upp och ner med tvära kast men det gavs utmaningar som puschade alla att lämna sitt komfortzon om man ville i en fullständig tillåtande och trygg miljö. Det är självklart upp till var och en hur man uppfattade övningarna och denna gång kändes det verkligen som jag kunde skala av in till min innersta kärna och fick se mig själv helt fri. Tack ni alla som var med på workshopen och hjälpte mig energimässigt att kunna göra detta! Jag håller verkligen med Therese om att ju fler vi är vid ett sådant här tillfälle desto starkare och lättare blir det energimässigt. Jag kände verkligen att alla var där för att expandera sitt medvetande på sitt sätt och accepterade fullt ut hur andra reagerar och agerar. Jag kan inte svara för att alla kände likadant men energin var så nära villkorslös kärlek som det bara kunde i sådan stor grupp människor av alla möjliga åsikter och synsätt. En glimt av en underbar framtid gavs under dagen tycker jag. Himmelriket på jorden kommer då den gyllene energin kan hanteras på samhällsplan. Den sista timmen på workshopen kändes jag så laddad av energi så jag hade kunnat springa en maraton med lätthet och glädje. -Hur kändes det på kvällen efter Workshopen? Underbart tomt i skallen och härlig energi i hela kroppen. Det pirrade som vid kristallisering så jag antar att ytterligare kristallenergi integrerades efteråt för min del. -Skulle du vilja vara med en annan gång? Självklart vill jag vara med ännu en gång! Om det är redan nästa gång bestämmer jag när det närmar sig. En insikt av många som jag fick var att vi ”övergångsmänniskor” behöver och kan endast uppleva denna form av workshop. De flesta rena kristallbarn kommer inte behöva dessa workshop eftersom de aldrig haft själsauran och dess begränsningar utan har levt sanna mot sig själva hela sitt liv. -Vilket tema önskar du dig då? Kraft! Att förstärka sin egna energikraft på sitt sätt och manifestation. Vi ska alla lysa som stjärnor och uppfattas som diamanter! -Om du fick skriva några ord fritt till oss, vad vill du då skriva? Jag hoppas till nästa gång att ni kollar om Scooters nyare musik passar in i sådana här sammanhang. De är fortfarande aktiva och jag är säker på några låtar från deras album ”Music for a big night out” skulle vara klockrena val. Men självklart är det jättebra med populärmusik som är av nyare sorten eftersom då påminns vi när vi lyssnar på radion efter workshopen för resten av livet. Ett förslag är att nån gång under dagen ha ett slags ledarpinne som får vandra mellan deltagarna på dansgolvet så alla som vill kan leda och få den underbara uppmärksamheten av alla underbara människor. Alla har något att ge och inspirera på sitt sätt! ”Stort tack för att jag fick vara med och fick träffa er och hela gruppen personligen. -Jag anmälde mig för jag behövde jobba med mina element. -Energierna var över förväntan höga och jag njöt av varje stund. Jag har dans vana och jobbar ganska mycket fysiskt med kroppen, men att jag skulle hålla igång i så många timmar var helt otroligt. -På kvällen hade jag träningsvärk i vaden,men allmänt mådde jag hur bra som helst och kände mig full av energi. -Jag önskar givetvis vara med nästa gång med. -Tema förslag:”Här och nu !”, eller nåt i den stilen. Några dagar efter workshopen satte processen igång med kraftig utrensning; ryggen, halsen, lätt nedstämdhet och gråt ibland, blandat med korta stunder av fullkomlig lycka och tillfredsställelse, sång, m m… känner stor tacksamhet över hela processen och emot er Anni och Therese som har gjort detta möjligt för mig och för hela gruppen. ”Jag anmälde mig till årets workshop för jag kunde inte låta bli! Det drog i mig och ju närmare den kom desto säkrare var jag på att jag skulle dit. Och dagarna innan längtade jag, för då kände jag att jag behövde den! Och det visade sig stämma bra. Innan workshopen har jag arbetat med förlåtelse och acceptans i en privat situation, under dagen hände någonting som totalt förändrade allt. Jag hade kommit långt innan, men efter denna dagen är allt bara självklart. Jag vill gärna vara med på nästa workshop. Jag har varit på alla hittills. Ingen är den andra lik och varje gång innebär energimässiga vinster som jag inte vill vara utan. Det har också börjat kännas som att jag har fått en ny STOR familj! Så roligt att träffas och härligt att vara i dessa energier. När man dessutom vet att när vi är så många tillsammans så har vi möjlighet att skapa någonting stort, som har betydelse inte bara för individen utan också för helheten. Power! Min livsuppgift är bl a att hjälpa till att höja frekvensen både i människors enskilda liv och på planeten Jorden. Den uppgiften delar vi många tillsammans. Att träffas såhär många tillsammans innebär frekvenshöjning på alla plan, och hjälper oss att ännu bättre utföra vår livsuppgift här på Jorden. “Hej! Planerade en resa till Göteborg när jag såg att det skulle vara en workshop i Falkenberg. Kände intensivt att detta vill jag vara med om och resorna gick enkelt att kombinera, förmodligen var det meningen. Ni sa också att de som skulle vara där var där och det stämde för mig. Det senaste året har varit ganska jobbigt med mycket nytt att lära och släppa taget om, både på jobb och privat, så jag behövde verkligen få in en rejäl energikick. Jag har ibland svårt för stora folksamlingar, men energierna mellan oss var bra från början, om än något förvirrade och det var så intensivt jobb under workshopen att det bara var att flyta med. Jag älskar att dansa och det var härligt att verkligen få släppa loss och skaka bort det jag inte längre behöver bära på. Det jobbigaste för mig var att integrera energin i kroppen, men det kändes väldigt bra när det väl var gjort. Jag brukade bli alldeles svullen och fuktig om både händer och fötter när det var varmt, en följd av att man har Venus-energin utanför kroppen, om jag förstod rätt. Det verkar ha rättat till sig, nu är jag varm, men varken svullen eller fuktig. Underbart! Känner att jag är mer kärleksfull och accepterande, personer som jag tyckt var jobbiga är inte lika jobbiga. Visserligen har jag rensat en hel del, vilket för mig som har dominerande vatten-element innebär att magen står i fokus. Har varit en del springande på toaletten… Utrensning av gammalt känslomässigt skräp helt enkelt. Jag har fortfarande en del att jobba med, men känner att jag förstår bättre vad som och varför det händer. Kan absolut tänka mig att vara med på en sån här upplevelse igen och Kärlek är visserligen ett tema som alltid är aktuellt, men jag kan tänka mig att jobba med temat Styrka eller Mod. Jag är inte säker på att jag förstår det här helt ut och ibland undrar jag vad jag sysslar med, men, samtidigt fanns det ingen annan väg. Jag har varit rädd för allt och har burit/ bär ganska tuffa känslomässiga sår och en jobbig separationsångest. Har jobbat med den i hela detta livet, förmodligen andra liv också och börjar bli trött på det. Jag hoppas kunna landa i en känsla av total oräddhet, där jag kan acceptera ”skilsmässor” från de jag älskar utan att känna en sån fruktansvärd smärta. Yngste sonen har t.ex. en flickvän som bor i andra änden av jorden och det är underbart när hon kommer hit, men hjärtat slits ut bröstet på mig när hon ska åka hem och jag mår dåligt både före och efter. Jobbar på att kunna hantera sånt bättre. Är rejält trött på att trilla i den känslofällan gång på gång. Ja, det var fritt ur mitt hjärta. ”Hej Therese och Anni! Tack för en underbar dag som kommer att leva kvar i mig länge, förstår att det pågår en process som inte går att sätta ord på. Jag önskar att jag kan känna det ni ser i mig. Fick en hel del bekräftelse under dagen när flera kom fram till mig och berättade att de var glada att få lära känna mig. Jag anmälde mig tidigt för något i mig var väldigt angelägen om att få delta. När jag läste om workshopen visste jag direkt att jag skulle vara med. Om jag inte agerar direkt brukar det jag vill göra falla i glömska eller så prioriterar jag bort det. Jag vet inte om jag rycktes med i nedstämdheten många hade känt eller om det är min livssituation som gjorde att jag lät min glädje sjunka undan. Två dagar innan blev jag full av energi på ett förvirrat sätt, hade svårt att samla mina tankar och göra något vettigt. Det var ett under att jag lyckades packa min väska. Jag var hos min vän Annica Andersson i Hjo, vi åkte tillsammans till Falkenberg på lördagsmorgon. Vi hade satt våra mobiler på väckning, ingen mobil ringde när de skulle. Jag hade satt min mobil en timme för sent och Annica hade missat att det var lördag så hennes skulle inte alls ringa. Dessvärre blev det en felkörning som kostade oss en dyrbar kvart, men efter det flöt det på bra och vi var framme bara några minuter efter halv nio. Jag kunde känna av energins olika faser och karaktärer hela dag, hur kraftfullare den blev allt eftersom dagen gick. Jag skuttade runt en del i lokalen och kände av skillnaderna i själva rummet. Energin längst ner i rummet kändes långsammare och tyngre på något vis, än längst fram. Det var mysigare att hålla sig längst fram vilket jag gjorde oftast. Fram på dagen kändes mitten av rummet lika gemytligt som längst fram. Helt otroligt att bli så sensitiv och kunna känna skillnaderna med enkelhet. Jag kände hur jag växte med energin hela dagen och kunde bejaka mig själv mer o mer. Jag var bara två veckor och två dagar gammal AT när workshoppen var. När jag gjorde AT’n hos Cecilia Wreding så skickade hon strax därefter en länk om workshoppen. Jag lade det åt sidan och kände att det var inget för mig. Två veckor senare fick jag plötsligt en stark ingivelse om att jag var tvungen att kolla vad det handlade om. Fick inte mycket till svar, förstod inte vad som väntade men kände direkt vid kontakten med Therese att det här var jag tvungen att åka på. Märklig förväntan! Känsla av att något viktigt var på gång. Tiden från strax före AT’n och framåt har varit fylld av märkliga och starka upplevelser. Oj!! Wow!! Gick dit med ett öppet sinne och utan förväntningar. Att vi skulle dansa förstod jag, hur det skulle gå till hade jag ingen aning om. Det var egentligen skrämmande då jag hela livet hävdat att jag inte gillar att dansa och har ofta gömt mig bakom uttrycket ”Jag är musiker och musiker dansar inte!” Trots det infann sig aldrig någon känsla av obehag, snarare precis tvärtom. Från första stund kändes det helt ok att dansa 🙂 Visserligen dansade jag nästan hela dagen med slutna ögon, kändes bara underbart att göra det. Jag märkte ganska snart att jag trivdes bäst längst bak nära dörren ut, för att däremellan göra små turer in bland alla deltagare. Energierna mitt ibland alla var så påtaglig och stark så det var skönt att kunna gå in och ut i det istället för att vara i det hela tiden. Kärleken mellan alla, till alla från alla var underbar att känna och stor att ta in. De fantastiskt starka reaktioner som skedde inom mig var helt oväntade men samtidigt så fantastiskt befriande. Alla har ju sin resa att göra och allas historia är lika fantastisk. Min resa började för tio år sedan då jag inte längre ville leva, mycket har hänt sedan dess och jag har en känsla av att de första tio åren varit en förberedelse för att jag nu ska kunna ta de här avgörande stegen till förändring. Det ger mig en obeskrivlig känsla av frihet, sanning och kärlek inom mig, till mig och till alla och allting omkring mig. Jag har aldrig sökt de ”alternativa vägarna” utan har på något vis bara råkat snubbla in i det. Tänkt, grubblat och skrivit har jag gjort massor på egen hand genom åren och nu får jag plötsligt, inte bara ny kunskap utan även en hel del bekräftelse och det är starkt. Till att börja med kändes allt underbart, det förbyttes senare till en massa konstiga känslor och tankar. Sorg, ensamhet, tomhet. Senare infann sig en känsla av att jag började förstå var känslorna kom ifrån, att allt inte var mina känslor och då kunde jag börja reda i det, sortera…för att senare må riktigt gott igen. Som ni säkert märkt och förstått så finns stark kärlek till och från en av deltagarna och det gjorde det väl inte helt lätt att förstå hur allting hängde ihop. De följande dagarna har varit mycket omvälvande och befriande. Jag vet nu i mitt hjärta att det här är min väg att gå. Ingen tvekan, inget tvivel finns kvar inom mig. Nu finns det bara en trygg, lugn tillförsikt inför allt som komma skall. Jaa, definitivt. Utmaningen blir väl att försöka komma utan förväntningar med tanke på alla de sensationer som skett i mig under tiden från själva AT’n till workshoppen och efteråt. Jag vet inte. Jag är ju ganska nyfödd och med allt som varit och är så har jag fullt upp att ta in, bearbeta och smälta. Vad kan jag mer önska mig? Hmm? För några år sedan under en av alla ”tänkarnätter” formulerade jag tre ord som för mig stod för grundstenarna för att jag skulle kunna må bra. Dessa tre ord var Kärlek, Frihet och Sanning. Temat denna gången var ju kärlek så kanske går det att göra något på Frihet eller Sanning? Tack, tack, tack! Jag förväntade mig inget och fick allt! All kärlek till er och alla andra och inte minst till mig själv. En av alla de starka händelserna var när jag hittade den lille pojken som var jag en gång i tiden och när jag förstod att jag en gång, då jag var väldigt liten lämnade mig själv åt mitt öde. Jag lovade mig nu, gång på gång, att aldrig mer lämna den lille pojken ensam igen. Den smärta och sorg som kom fram är det mest förlösande jag någonsin varit med om och det blev möjligt tack vare allt som hände denna dag, tack vare er, alla deltagare och mig själv. Jag ville först anmäla mig direkt när jag såg det. Började sen tänka på att det var mycket pengar osv. Sen stängdes anmälan och jag visste att jag gjort fel. När det blev möjligt att anmäla mig igen gjorde jag det direkt. Jag hade vetat hela tiden att jag skulle hit. Bara fastnat i gammalt tänk. Jag BARA ViSSTE att jag skulle dit. Sinne och kropp var helt överens. Det var lite mer än två månader sedan jag gjorde min AT och mitt system har kraschat flera gånger. Det som hände var att jag blev lugnare ju närmre träffen jag kom. Mer till freds och började känna en koppling mellan sinne och kropp. Hade inte heller några speciella förväntningar för jag visste att jag inte behövde ha det. Det var också nytt. Inga förväntningar. Tillit istället. Att komma in på hotellet och bli bemött av de andra med en presentation, stora leenden och välkommen hit, gjorde att energin steg redan innan halv 9. Det var en helt magisk känsla. Att vara 86 personer, få lov att vara i mig själv och samtidigt ge och få enorma mängder energi. Wauw. Svårt att beskriva känslan med ord. Kan bara skriva att jag kommer aldrig mer att tveka när det kommer till att anmäla mig igen Jag står först i kön tillsammans med många andra. Vet att nästa gång blir vi inte 86 vi blir så många fler. Om det var magiskt med 86 hur blir det då när vi blir fler. Taklyft kanske. Längtar och har redan bokat in nästa träff. Att släppa så mycket tankar, känslor som jag gjorde skapar plats för nytt. Jag åkte hem och hade tömt min ryggsäck på ytterligare saker. Det kändes underbart att gå rak i ryggen med ett leende på läpparna och en varm känsla av kärlek i hjärtat. Fulladdad med kärleksenergi. Innan träffen hade jag mycket känslig hud, ibland smärtsamt vid beröring. Nu var det borta och en varm skön känsla var kvar. Min energi bubblade och jag ville bara fortsätta dansa. Redan bokat in datumet. Nästa gång åker jag dessutom med många vänner. Vi ska värma upp innan träffen. Att våga stå upp för den vi är, är en av de viktigaste budskapen i AT. Att våga stå upp för ansvar och kärlek är STORT. Utan er hade min resa blivit lång och hård istället för lång och kärleksfull. Tack för ert mod att ge er kärlek till oss okända. Nu är vi ju inte okända längre. Nu är vi kärleksboostade tillsammans :-)!!!!!! ”Jag har tidigare vart på WS med Therese och Anni som var givande därav inte svårt att anmäla sig särskilt som ämnet var KÄRLEK. Dessutom kärlek till mig själv. Gruppens energi under WS var oerhört stark och alla arbetade under WS koncentrerat och att då arbeta med sig själv var både givande och lätt. Även innan WS så fanns det lite ”förpirr” på vad som skulle ske och om jag skulle få frågan om jag ville vara med på ytterligare WS definitivt ett JA. ”Jag anmälde mig till workshopen då jag instinktivt visste att jag bara måste det för min personliga utvecklings skull. Veckan innan workshopen kände jag mig upprymd, förväntansfull och glad. Känslan av ”äntligen dags” började infinna sig. I början av dagen var jag lite tillbakadragen och kände mig lite olustig över att dansa i samma rum som alla dessa främmande människor. Men den känslan lade sig snabbt då jag såg när jag sneglade runt i rummet att det var inte en enda av deltagarna som fokuserade på någon annan än sig själva. Det fick mig att slappna av och gå in i mig själv och det som är mitt innersta – wow vilken känsla! Energierna under dagen var helt underbara att vistas i. Processen under dagens gång litade jag på och jag releasade massor! Tack för att ni ordnar dessa träffar, det känns viktigt med möten och uppgraderingar! Det känns som om processen börjar då man anmäler sig till eventet. Kände mig uppåt och glad hela dagen och så har det fortsatt. Hade väldigt mycket energi i kroppen dagen efter. Önskar er både en vacker och glädjerik sommar och ser fram emot kommande ”dansparty”! En venninne hadde fortalt om denne workshopen og ville at jeg skulle være med, og jeg kjente med en gang at dette ville være bra for meg så jeg sa ja, men så ombestemte hun seg og jeg tenkte at det er det ikke meningen, men så hadde jeg en time med Therese, og når hun nevnte den for meg, så bare visste jeg at den måtte jeg være med på. Det var veldig tøft prosess ukene før, spesielt siste uken. Balanse, ro, lett, harmoni , ingen motstand, alt gikk så lett, samarbeid, riktig timing, rettere sagt PERFEKT. Dette er sånn jeg kjente energien når jeg jobbet og i rommet. Det var ingen motstand på å gi slipp, det var bare som det fosset ut, som Niagarafossen slapp løs. HERLIG. Balanse hadde vært et interresant tema. ”Hej kära ni! Jag skriver helt kort för att TACKA för en fantastiskt bra kurs i Planetkunskap. Jag är djupt imponerad av denna kunskapskälla som ligger till grund för utbildningen! Jag kände mig inte så lite snurrig där på slutet, så jag tror inte jag kunde uttrycka min TACKSAMHET för all kunskap och för ert otroliga engagemang för att tillfredsställa allas olika behov, av både kunskap och praktiska ting. “Hej Anni! Jag märker att jag fortfarande håller på att smälta Planetkursen. Tyckte att jag sen gammalt hade en rätt grundläggande kunskap om de olika planeterna genom astrologi, men upplever ändå att denna utbildning förde fram kunskap på en helt annorlunda och högre mer flytande nivå. Trots att detta var en mycket komprimerad kurs med mycket kursinnehåll och långa kursdagar som kunde kännas som en anspänning i stunden, så blev ändå kunskapen så lätt och flygande och lättillgänglig på ett härligt sätt. Jag har ju även gått basutbildningen om de fyra elementen och upplever nu efter planetkursen än starkare hur viktiga, förtydligande och djupt länkade dessa båda utbildningar är. AuraTransformation™, kunskap om de fyra Elementen och Planeterna hänger verkligen och mycket nära samman. Jag är så Tacksam över att ha fått möjlighet att förkovra mej om Planeterna nu på detta sätt. Tack Anni för att Du delar med dej så frikostigt både av din kunskap och din personlighet. “Jag har alltid varit intresserad av att söka och se ett större sammanhang i tillvaron, som människa är jag väldigt nyfiken och vill mycket gärna lära mig mer om saker och utveckla mig vidare, många gånger i mitt liv så har jag också också varit för ivrig och velat veta för mycket på en gång. Jag är väldigt spontan och känslosam som människa och samtidigt ibland väldigt mental. Den här kursen har hjälpt mig att se mig själv mer där jag är. På själva kursen var det mycket som hände och det var bitvis svårt att ta in allting, men nu i efterhand så har jag varit med om en otrolig utveckling på bara några dagar. Jag har ett flöde i livet som jag aldrig har haft förut och har börjat förstå att jag duger precis som jag är, att jag varken behöver göra mig större eller mindre än jag i själva verket är eftersom allt är lika viktigt i helheten. Jag har också lärt mig att jag inte behöver förstå allt på en gång och att saker inte behöver vara perfekta direkt, att det finns ett större sammanhang i tillvaron och att det allra viktigaste i livet är vart jag befinner mig just nu.